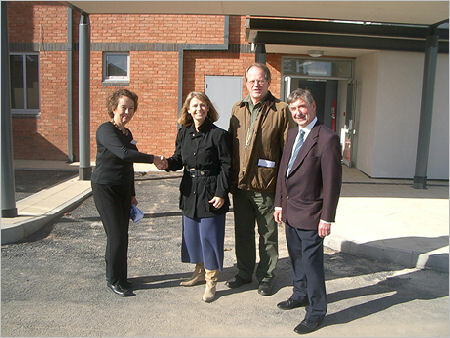 Harriett Baldwin, Conservative Parliamentary candidate for West Worcestershire joined over 500 other interested visitors who were given tours of the new Pershore hospital on Saturday. The hospital is on the first floor of the purpose-built building and will have 26 beds. The ground floor will house Dr Pitts Tucker and Partners in a Medical Centre with 21 consulting rooms. The hospital will enjoy a high standard of equipment thanks to the generosity of the Friends of Pershore Cottage Hospital. The top floor will have NHS dentistry. The hospital was built for Wychavon District Council using their resources and will be leased to the Worcestershire Primary Care Trust and the Pitts Tucker Partnership. Harriett Baldwin congratulated all involved in the successful completion of this project which will be a valuable resource for the community for years to come. "Wychavon District Council is a great example of a well-run council with the will and the resources to partner with the PCT and a local medical practice to really make a difference, despite the NHS crisis in Worcestershire. Congratulations to Cllr Mrs Judy Pearce and the rest of the district council team. I hope that Malvern Hills District Council can learn lessons here that can be applied for the benefit of people in Malvern"
Photo: Harriett Baldwin congratulates Cllr Mrs Judy Pearce, in charge of the Health portfolio for Wychavon District Council, accompanied by Malvern Town councilors Ralph Madden and Paul Tuthill.